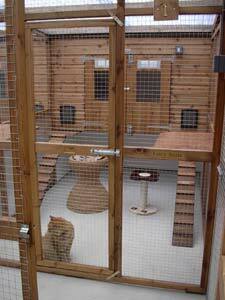 Paw Prints Cattery offers a “Home from Home” holiday environment with 24/7 expert care and attention for your beloved pet cats, they will be completely well cared for, happy and safe along with enjoying their stay! Lots of attention and cuddles! Chalets available are singles (1 cat), doubles (up to 2 cats), large and extra large (up to 4 cats) penthouses, all heated and thermostatically controlled and fully insulated and built to required licensing guidelines offering plenty of room for exercise and rest. Our single chalets have full height run doors which can open up two adjoining singles to become an extra large chalet for even more space and adventure for 1 to 4 cats! 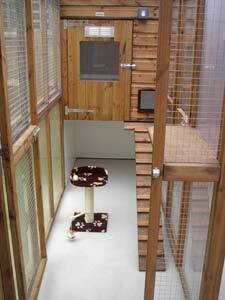 We also have a quiet chalet separate from the others for a cat who requires its own environment, this would suit an elderly or infirmed cat. 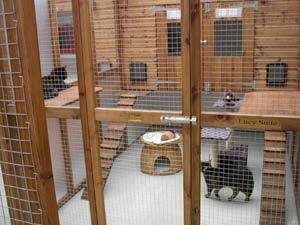 We offer a very wide range of wet and dry food so as to cater for all guest cats needs. WET FOOD - Our standard is Felix "As Good As It Looks" both fish and meat varieties but also supplied is Whiskas various varieties - i.e the Simply Range - meat and fish. Also Tuna in Spring Water. Other varieties are also supplied - please ask. DRY FOOD - includes James Wellbeloved, Go Cat, Whiskas, Iams, Royal Canin, Hills Science Plan, Burns, Purina One. 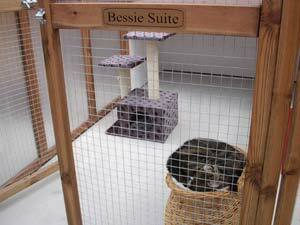 We also supply Kitten and Senior varieties of most of the above wet and dry foods. 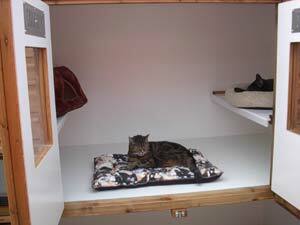 We will discuss each individual cat/s dietary requirements upon their booking. Any vet prescribed food /diet for your cat/s please bring this with you. We also support Cat's Protection. TOYS: Provided – of course! – selection of catnip mice and balls, etc. LITTER: Lightweight 100% Natural Wood Base - manufactured from recycled saw mill waste, completely safe and environmentally friendly, natural pine fragrance, superior odour control, 100% biodegradable, more than twice as absorbent as other litters so up to 50% less waste. We use VIRX2 quick working high level disinfectant and cleansing system which is designed to help with health and hygiene around both people and animals. It is safe and non-corrosive, powerful cleansing, can be used in all areas and on all surfaces, proven fully effective against MRSA and all viruses such as calici virus and against bacteria and against fungi such as aspergillus niger. All chalets are completely cleaned and disinfected when a guest leaves. Guests are most welcome to bring any of their own items - furniture, beds, toys, etc. - and food/treats! Any special diets which you give your cat or as prescribed by your cat’s vet, but please let us know about these and bring the food with you upon arrival or give it to us upon collection of your cat (if using our collection and delivery service). We can administer prescribed medication orally and via injection.